If you ask a random person on the street “What is madness?”, they`ll probably tell you that it`s a sort of sickness of the brain that makes you lose touch with reality and see things that are not real. Such a general explanation seems to be so widely accepted, that it is rarely questioned even among professionals. 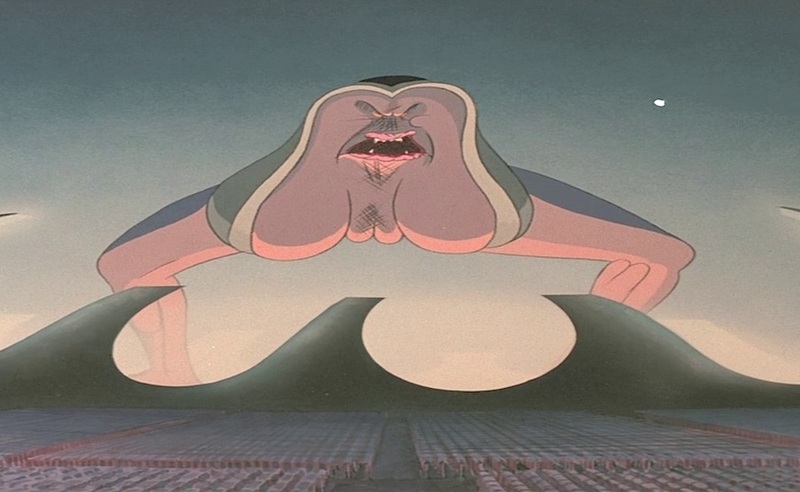 However, in the music of Pink Floyd things seem quite different. The mental breakdown of the founder of the group Syd Baret left a deep mark on the other members. Years later, after having achieved world fame without him, they`ll incorporate the theme of (his) madness into their most successful albums. Full of ambiguous metaphors, allusions and unclear references, their songs will give a different perspective on the matter. Their lyrics portray the madman not as someone who`s out of touch with reality, but rather someone who actually knows something about the world, which everyone else fails to see. As Roger Waters said, “The Wall” is still as popular as ever, because throughout it there is something which runs beneath the surface and resonates with us all in an odd way. 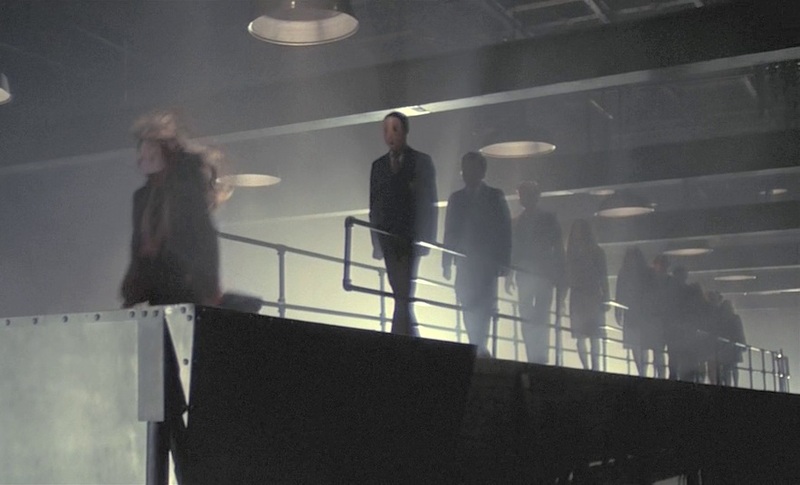 It is in this album and in the film released some years afterwards, where madness takes center stage. 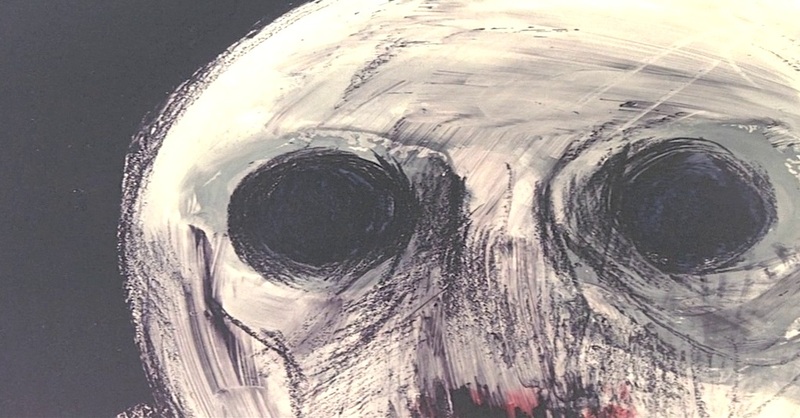 With a brutal and raw tone the songs tell the story of a person going insane. Although the lyrics are often mixed with seemingly unrelated and strange reflections on different topics, they actually unfold a life story. The main character is called Pink and as with all people, his story begins before he is born. In the beginning we witness his childhood marked by an absent father, who is killed during the war when Pink is still a baby, and by an overbearing mother who wants nothing for him, but to stay with her forever and be adorned. From there the story takes us to Pink`s difficult entry into society, represented through the image of a harsh and cruel school system. The classroom, which will eventually become a symbol of the whole album, crushes individuality. 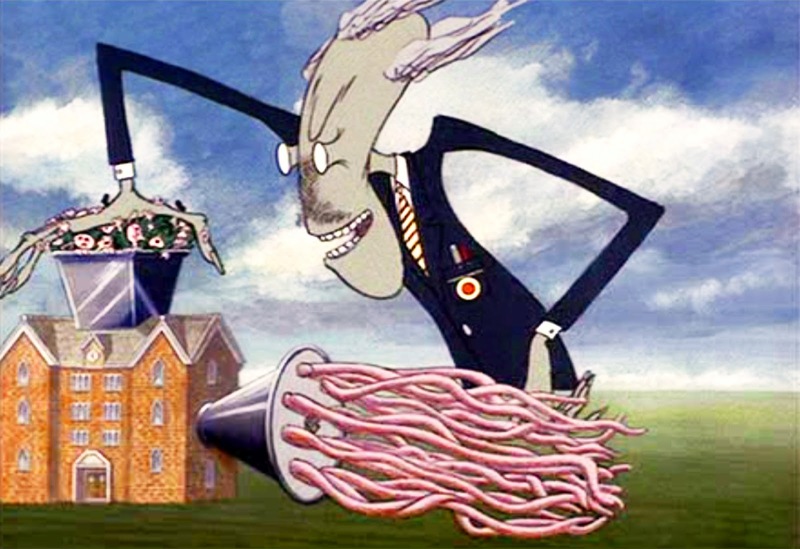 It is revealed that behind the closed doors, teachers abuse the children with an almost sick sadistic satisfaction. 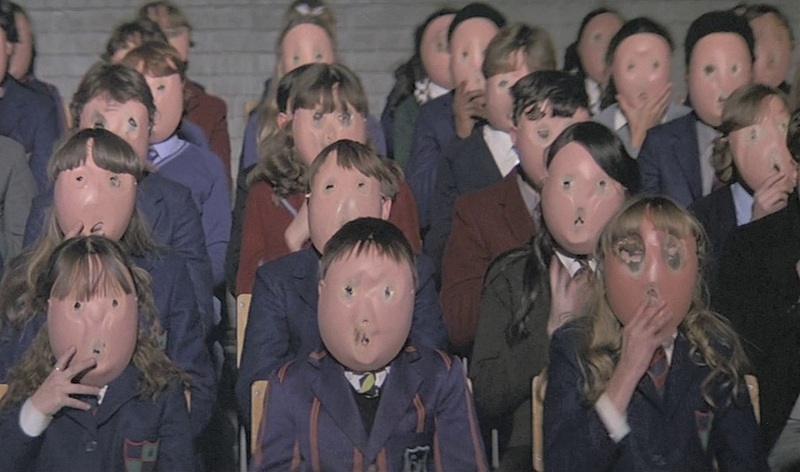 Years later, in his hallucinations, Pink will revisit this school where students wearing horrific masks on their faces will march on production lines only to fall in the end into an industrial meat grinder and come out of it as minced meat. Yet in spite of all the hardship in his childhood, Pink will eventually overcome the difficulties, break free from the system and become a musician – a “bleeding heart” as the teacher called him, sarcastically mocking his poetic talents. In the end of the first act we witness how he, now all grown up and famous, is almost unwillingly lured into the rock star lifestyle along with all of it`s excesses (much like the real Syd Barret). But after achieving fame and fortune Pink begins his descent into alienation. The lyrics reveal the inner life of a person who slips away from the world. He can`t fit in, his marriage falls apart and he gradually retreats into complete isolation. The passions and struggles of other people seem ever more strange and meaningless to him. His attempts to reconcile with his wife are sporadic, sometimes desperate and always awkward. He gradually descends into madness and begins to see horror all around him – both in the social and in the intimate world. In his hallucinations we witness the terrifying senselessness of war, the brutality of a social institution, the murderous folly of totalitarian ideology and the mortifying rhythm of the modern consumer-driven life. 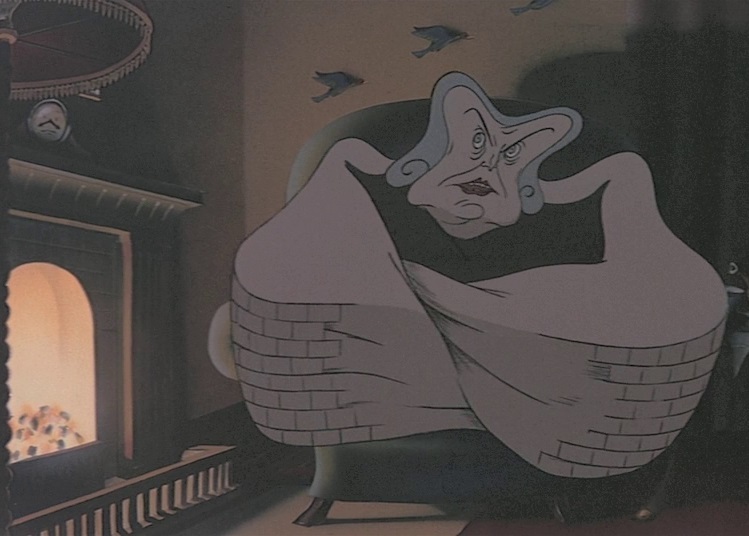 He sees his mother`s love as literally consuming and suffocating and her embrace – as a wall. 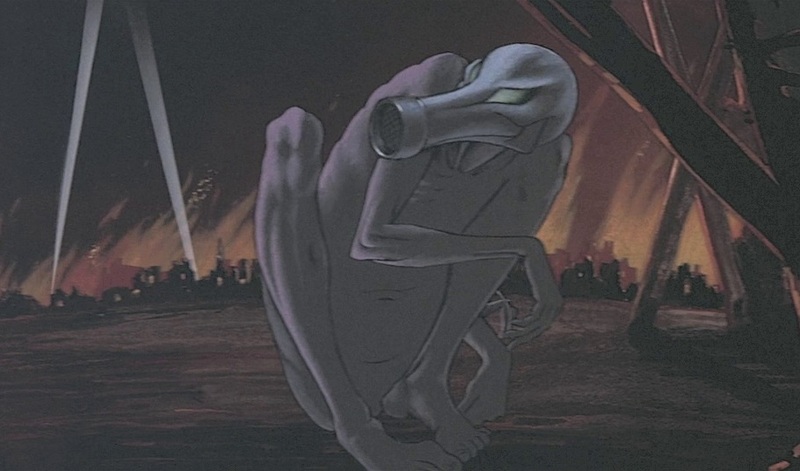 His wife is depicted as a vile praying mantis who defiles his body, and his teacher – as a hammer who wants to flay him into shape (or maybe to turn him into another hammer?). In the end of his story Pink realizes that he has gone mad. In his final moment, he is brought before the wicked court of his own conscience in order to be judged. He is accused of showing human feelings and of being mad, which ruined the lives of his loved ones. In this final act, where everyone takes turns accusing and mocking him, he is depicted as a tiny lifeless rag doll, which is thrown around by the grotesque and menacing characters of his story. And it is precisely here, in the terrifying spectacle of this perverse “trial”, where we witness something, which is far from being “out of touch with reality”. Here, in the peak of his madness, Pink encounters something which is in a way much truer, much more real than reality could ever be. He comes to see that his entire life he has really been a tiny rag doll – just a thing in the hands of others, a piece of animated meat which is not entitled to have human feelings, an object for everyone else to enjoy and use, and this is the horrifying truth about his place in the world. And in Pink`s madness we see it all. We see the overprotective and controlling mother who intrudes into every aspect of his being. Someone who wants to keep him forever under her wing only to be adorned and safely kept behind the bars of the cage called home. We see the school system, which treats him as a lifeless object, as a soulless automaton devoid of any personality, which is to be programmed and incorporated into the sea of lifelike machines that support the system. We see the wife, who views him as nothing more than a mere object of her sexual satisfaction and his band managers, who treat him as just another rock star which they can exploit for profit until he`s utterly exhausted and then throw him away in the garbage with all the other ones before him. To exist for the sole purpose of being an object for the use and pleasure of others is unbearable for the human being, equal to being neither alive nor dead. This horrifying answer to an existential question, which Pink cannot escape from, is the quintessence of his madness. And this is why, in this extraordinary story, Pink doesn’t really break away from reality. He does indeed breakdown mentally, but he doesn’t become grotesque, chaotic and irrational. On the contrary – it is the world that is revealed to be so. 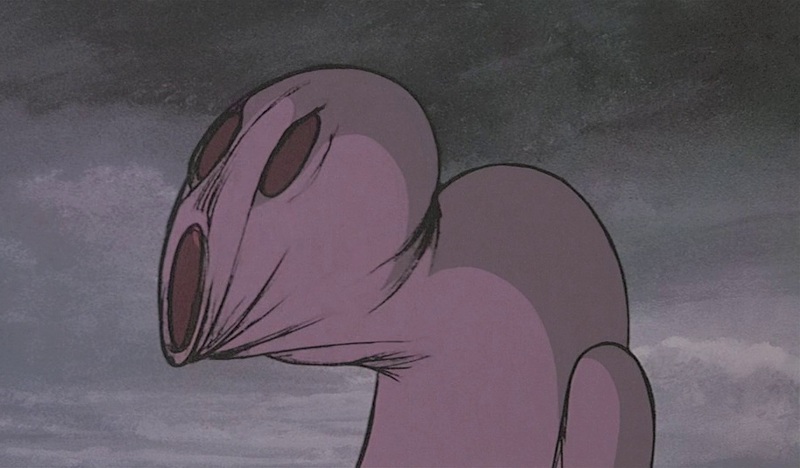 In his madness Pink starts to see a terrifying aspect not only of his own life, but also of the world itself and his terror is to not be able to shut his eyes. 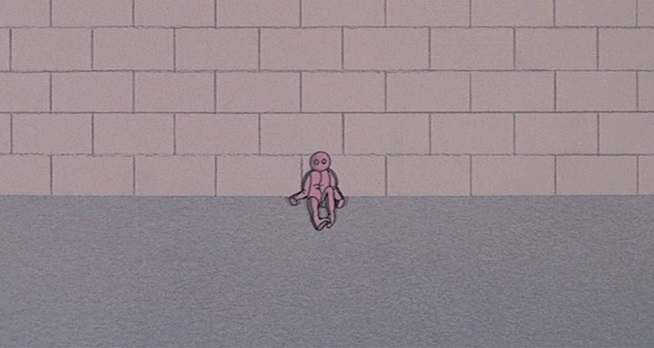 While “normal” people are able to keep an inner distance from it all Pink cannot and has only one way to save himself – to build a wall and live in perfect isolation. But his madness tells us more than that. By staging the horrible truth of his own life, his insanity also makes us see a certain truth about the brutal machine which today`s society can be. 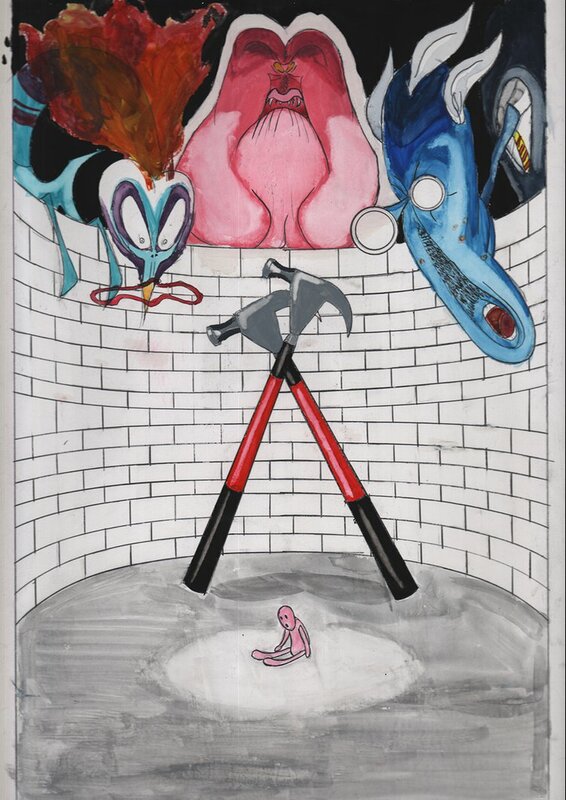 Pink sees not only himself, but also the modern man as devoid of any intrinsic value – as just an object, a thing, a lifeless machine, a hammer in an endless army of hammers or simply as another brick in the wall. Once immersed into this gruesome world, the desires of others begin to seem strange and even threatening to him. He can no longer relate to another human being like other people do. Society is exposed as brutal, inhumane and mercilessly exploiting all, and his loved ones – as monstrously egotistical creatures who take turns using him as an inanimate object for their own sick satisfaction. All his life Pink was building a wall in order to save himself from a reality which is unbearable for him. A reality that he can neither hide from himself, nor give another meaning to. And after all this, it is perfectly logical that in the grand finale of his story, when the judge finds him guilty and deserving the full penalty of law, his punishment is his deepest fear – the wall is to be torn down so that he is exposed before his peers (probably meaning death?). The destruction of the wall marks the end of his story. 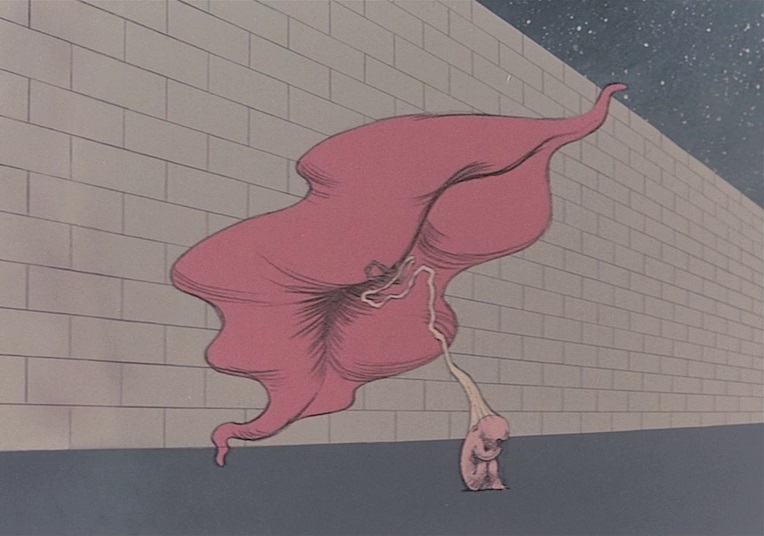 Usually the wall in “The Wall” is associated with alienation, a fundamental obstacle within society, something that is imposed from outside, which separates us all. A barrier which we must all fight to destroy, so that we don`t lose touch with one another. Of course this is all true from one point of view, but in another sense it is also a very ironic misconception. 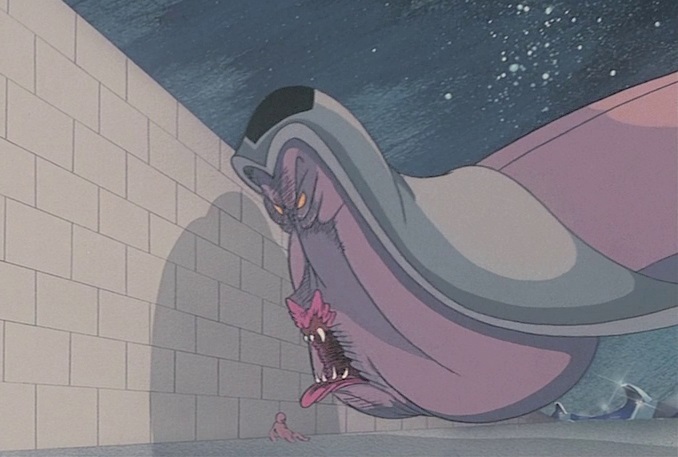 It is ironic namely because Pink actually needs his wall. Although he tries to free himself, he actually depends on it. He built it himself – it is the only thing that kept him safe from a world that he cannot bear and this the paradox of his tragedy. 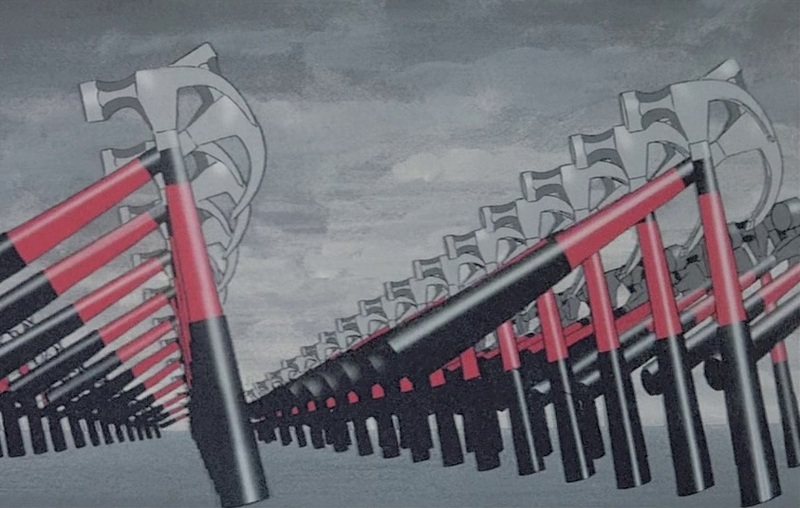 If previous Pink Floyd albums like “Dark side of the moon” have articulated questions, as Roger Waters says – about whether or not the human race is capable of being humane, then “The Wall” is undoubtedly an answer. Society can be seemingly “normal” or “humane”, but one can live in it only on condition that he is able to repress in his mind certain truths about it. He must not know the cost of his own happiness nor the paradox of his desires. He must be able to see himself as something more than a mere screw in the powerful and unforgiving machine of modern society. Only the ability to not see the horrors of the world, will enable him to live a “normal” life. There are many possible interpretations of this story and we can speculate endlessly on what it all means and still get it wrong. 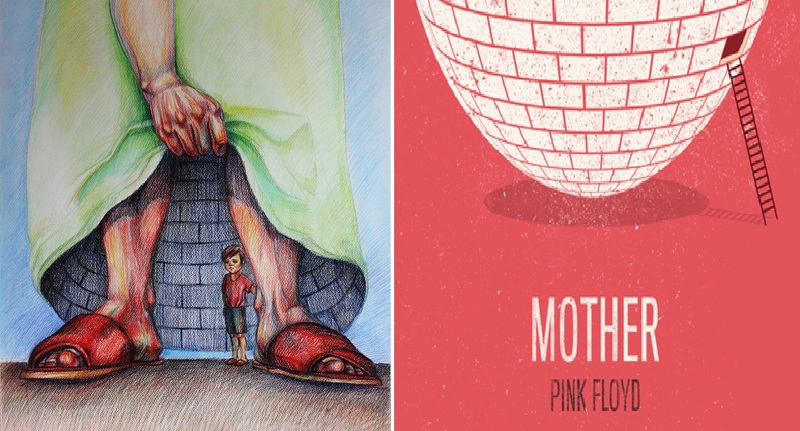 But one thing is certain – Pink Floyd`s music shows us that there is a certain dimension to our fantasies, dreams, fictions and even to madness, which reveal something truthful about our inner world. Something which can turn out to be much more real than reality itself. Truths that we can`t easily accept without questioning the coordinates of what makes up our own “reality”. 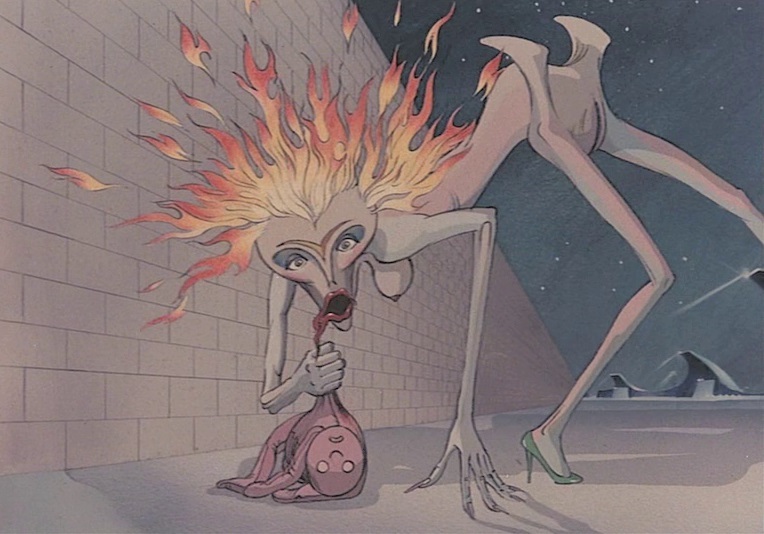 The music and lyrics of “The wall” are dark, irksome and harsh, but at the same time they convey deep humanity and a true compassion towards those who are most rejected in our society – the mad. An extraordinary respect for people, who have much to tell us and whose “nonsense” is worth hearing out. There are many scenes in the movie, where as a child Pink is looking for his father in different ways, he finds items that belonged to him, dresses in his uniform and even wanders around a trainstation where soldiers who return home are greeted by their families. The third song is devoted entirely to his father and the seventeenth – “Vera” is an allusion to the song by Vera Lynn “We will meet again” – a hit song among soldiers during WW2, which contains Pink’s ironic question about what happened to the promise of his father to one day return home. 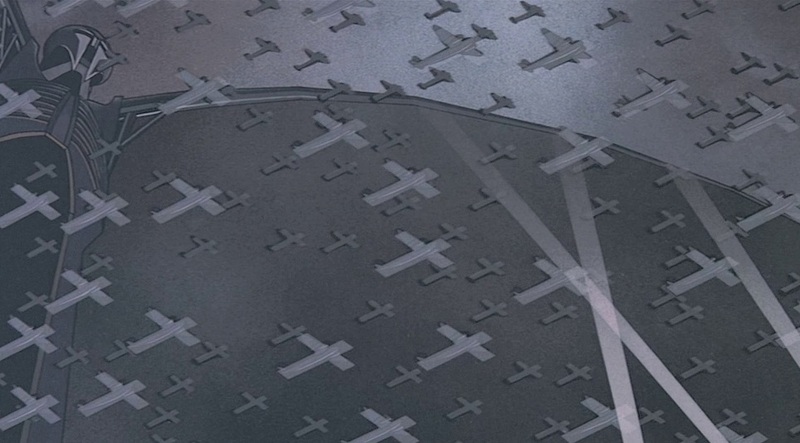 The second song “In The Flesh” ends with sounds of war planes, which in the movie mark the death of the father during the war. 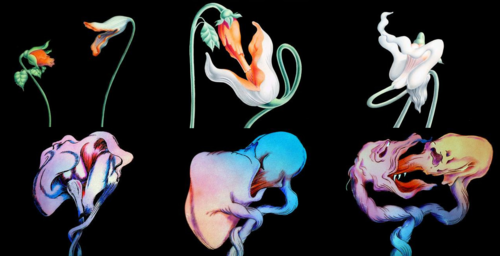 The death of the father coincides with the birth of the baby (the baby cry in the beginning of the next song). The songs “One Of My Turns”, “Empty Spaces”, “Don’t Leave Me Now”, „Hey you“, ”Nobody home” all deal with his alienation from his wife and the world, and his desparate attempts to not slip away into complete isolation.